A few years back, the world music world was enjoying a flurry of activity from Garifuna artists. Aurelio Martinez went international with his 2004 album Garifuna Soul, Andy Palacio released his magnificent Watina in 2007. For his musical and cultural efforts, Palacio was hailed by the New York Times as the man "who saved Garifuna music." Both artists toured, and Palacio even made a live guest appearance on Spin The Globe in August 2007. Then Palacio passed on in January 2008, and the Garifuna world seemed to go dark. Sure, there was the great Umalali: Garifuna Women's Collective album and tour later that year, but since then we've had two years with little to speak of from this unique Central American culture. The drought is now over. 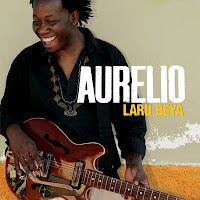 Aurelio is back, having lost his last name and found a big dose of West Africa on his new album, Laru Beya (Next Ambiance / Sub Pop, out 18 January 2010). While Garifuna Soul was focused largely on traditional drumming rhythms and vocals, the new CD brings in Youssou N'Dour, Orchestra Baobab, and more polished, melodic arrangements. When Aurelio and I were talking about how to approach the arrangements for the album, we became convinced that it had to be forward looking and tear down all the barriers. Andy allowed Garifuna artists to break free and be as creative as they wanted, free to go in any direction they wished. They don't have to be totally true to their roots, because Andy's work was very far from traditional music, but still clearly Garifuna. I hope Aurelio is okay being called the new Garifuna ambassador -- his signing with Seattle-based label Next Ambiance (part of Sub Pop) will certainly put him in front of many listeners new to Garifuna sounds. Aurelio's closeness with Palacio may have prepared him for this very role. "When we talked," Aurelio says, "we often discussed the rescue and preservation of the Garifuna culture and how to inspire the new generation to be proud of their culture." And if you take the time to read the song notes, you'll find the songs substantial as well as good listening, from the mambo-rock of "Wamada (Our friend)," Aurelio's tribute to Palacio, to "Wéibayua (Sharks)," his cautionary tale about the empty promises of politicians. Already one of my favorite albums of a year that hasn't yet begun!